There are no words to express the first encounter with a refugee. I remember being on the plane in Bambari, Central African Republic. We were being briefed by the United Nations personnel there on the airport ramp, a blood red clay that was being encroached on by the tall grass around it. Giant termite hills dotted the landscape, and it was sweltering hot. Our crew was currently on a mission to relocate Darfur refugees from rebel held territory in the north of C.A.R., in a tiny village called Sam Ouandja. 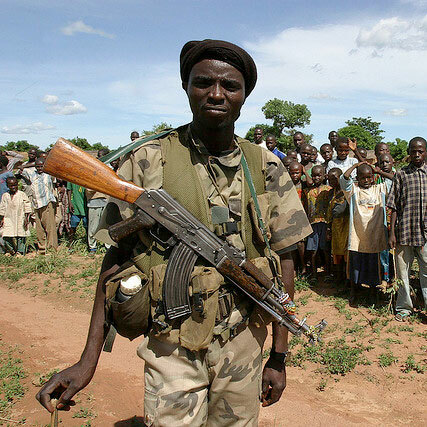 Located just miles from Darfur, it was home to over two to three thousand refugees, and a deal had been struck with the rebels to move them in just under three weeks. I was introduced there to a man named Ousmane, who spoke English, French, and Arabic quite well, and had been assigned to Sam Ouandja to help us with the movement. He was overseen by a fellow Canadian we had met the night before in one of Bangui’s serene, hidden French restaurants; I cannot remember his name, but he was an older gentleman who wore the Third World on his face, but stoned up his heart to it a long time ago. “These can be some sad places. The stink sometimes…” he recounted on the plane. This wasn’t his first time in a camp, and I began to get the picture. Sam Ouandja is nothing more than a small African village hastily outfitted to fit Darfur refugees. As we sat on the ramp, a tattered blue UN flag served as cover for the staff as they prepared us for what lied ahead. We were to load as many people as we could, and bring them to Bambari. As I peered out over the ramp to those waiting, I was hit with wonder, with shame, with such empathy it is hard to describe. I had followed the Darfur conflict before I came to Africa, but never expected to be on the edge of its front lines, and I wasn’t quite able to comprehend what had happened over here until I saw the lines of tired, stripped down faces in front of me. The ebony faces were drained, but full of a quiet dignity that were wrapped as elegantly as their clothes. We loaded them onto the plane, the first experience for many. They sat on the seats, Ousmane and I going through, buckling seat belts, explaining how to hold the baby on the airplane, informing them of where to be sick. Their faces looked up in puzzlement, but my patience never wavered. These people left another home, a refugee again as they were pushed further into a country that wasn’t their own. As they were loaded on, the captain and I would help fill our cargo hold. Rotten wood stools covered with rancid horse skin, some old crocs, various sacks covered with mites and fleas. I was never disgusted, but rather thankful as we loaded these on. The smell was almost unbearable, but the pride and concern coming from the front of the plane only echoed the investment in whatever items they had garnered over the years spent running away from Sudan. The flights were two a day, and were filled with frustration and challenge. The refugees peed on the seats and on the floor. Babies coughed up crimson bubbles and spat them on the back of the seats. Bugs were rampant. It was a constant uphill battle, but for the first time on the continent it felt like we were actually helping people. This continued on for three weeks, and the whole crew felt a sense of pride. We dealt with the good, the bad, and the ugly. The worst was when an infant died while waiting to be loaded onto the plane. The mother hid under a tree that lined the runway. “The manifest ready?” I asked. The #4 engine ran in the background. It dulled the senses and we got on board. And so it went. So it goes. So was life until our final day on the mission. Things were fishy from the start. We had moved out our Canadian liaison the day before, which meant the camp was effectively shut down. All refugees had been moved, and this sparked the ire of the locals who were living under a tenuous agreement with the rebel army situated there. Our last manifest was to pick up 75 bags of rice that had been left. We all discussed this as being a bad move, but agreed that it wouldn’t take long, and that at the very least we’d be on the ground fifteen minutes. What we didn’t know is that as we lifted off the ground in Bangui, destination Sam Ouandja, that the IMC, or International Medical Corps, the organization on the ground in Sam Ouandja, had pulled out their stationed ambulance that morning. A riot had developed, and we were none the wiser. The spark was lit, and the rice soon became the fire. When we landed, things felt immediately wrong. Ousmane came up to us in a tense mood, but I continued on as normal. Most of the rice had been piled up a few metres from the plane, and a throng of Africans sat near, waiting. Some yelling from the villagers could be heard, and I was opening up the cargo door as it all began to happen. The number 3 engine started to spool up. I started to hear yelling from the other side when I could hear yelling over it. Our rebel “guards” began to confront the villagers, whose voices started to escalate. I began to load the rice. That’s when the truck appeared with the last shipment. The crowd became like a group of sharks in a feeding frenzy. This is the first time I’ve written about this. I’ve buried it in my head since the next parts sometimes give me terrors at night, always wondering how close we came to being in a much worse situation. And I think of Ousmane on the ramp. But I need to get it down, even if it’s hazy, if only to state what happened as I saw it. It was at that moment we all realized we might be in a much worse situation. A mob situation is a frightening thing, especially a mob who are starving, poor, and no strangers to violence. The rebels started getting skittish, and came on board, their rifles level. They began to demand money and rice for their services. We pushed them off, told them to keep the rice, and we started to go. We motioned for Ousmane, but he was far in the crows, becoming surrounded. He looked back, and I won’t forget his face. He was determined to stay. I wish I could say what he was thinking, but there was resolve and sadness painted on his face. The engines started to rev up, I heard a gunshot, and pulled on the heavy Dash 7 door. We closed it and I took to securing the cabin. The AME we had with us put his foot on the door, and the crowd jeered and chased the plane. Some of the crew had said they had rocks in their hands, and it only took one to keep the plane there at the mercy of the crowd. The adrenaline pumped, I secured the cargo nets as we lined up and shot off, flying low to gain speed and get away from the scene below. I never looked out to see what was happening as we left. I had the best intentions of seeing if I could see Ousmane from the air, but knew better than to look down to an image I may not want to see. The cabin was a mess. Rice was everywhere, and I doubted the urgency and danger until I saw the other help we had pulled out. Their faces an ashen grey, they recounted the story of the ambulance and the terror of being at the mercy of the crowd. When we landed in Bangui, our UN handler was pissed. We only got half the rice, and “made a mess of the situation”. We ignored him, and went back to the hotel to grab a beer and decompress. Then the anger hit. We spent the rest of our time partying in Bangui, and I left Ousmane in the back of my head, but the guilt set in. We had left him, and even though he had wanted to stay, I was eaten by it. I had felt disillusioned before by feeling helpless in my role, but Ousmane only reflected the lack of resolve in myself. We never received any further info about him, and to this day I still wonder what occurred after we left him on that ramp. I haven’t looked into it further, afraid of what I might find. I quoted the definition of refugee at the beginning of this post because I thought it was relevant. Not only to those we helped, or those we left behind, but to myself as well. I’m not comparing myself to the plight of those who were in Darfur; that would be insulting and a disservice to their strength of character, of their resilience. Rather, I refer to the part that says they cannot return home, or are afraid to do so. I feel like a refugee from myself sometimes, in many facets. After Afghanistan I had a hard time relating to life back home. Traffic lights, paved roads, rules and regulations, everyday conversation. These were distant things, trivial, unimportant. I felt wound up, a spring, ready to pop. I wanted to get back to Africa. I wanted to get back to someplace that made sense to me now. At the same time, I didn’t want to return to my thoughts, my own sense of feeling. I felt like a border had been closed in myself, and I was committing an inquisition on myself. I took a long walk away from myself, and only recently have begun the journey back to discover what’s been left behind after being in conflict with my conscience for so long. I started this blog as therapy, to talk about things overseas in personal but objective way. I wanted to express the frustration, the beauty, the feeling of what seems commonplace now. It’s been a road map back to dealing with dilemmas inside myself, and the path back home is starting to be clear, and the demons are now by the wayside. They say you can’t go home again, and that’s true. But, as I’ve learned from Africa, home is a place where you’re fine with yourself. I saw it in the eyes of those refugees, and I saw it in the eyes of Ousmane on that ramp. I hope I can do enough to get back. Colin Nash is a writer and former actor who fell into contract work with the United Nations. He has worked in different parts of Africa and spent a six month stint in Afghanistan. He currently resides in Toronto. This post originally appeared on his personal blog, which you can visit here.